^ a b Thon, Caroline (2012). Armenians in Hamburg: an ethnographic exploration into the relationship between diaspora and success. Berlin: LIT Verlag Münster. p. 25. ISBN 978-3-643-90226-9. ^ a b c d e f g h i j Papazian, Dennis (2000). “Armenians in America”. Journal of Eastern Christian Studies (University of Michigan-Dearborn) 52 (3-4): 311–347. doi:10.2143/JECS.52.3.565605. http://www.umd.umich.edu/dept/armenian/papazian/america.html 2012年11月25日閲覧。. ^ a b c d e Bakalian 1993, p. 33. ^ a b Eisenstadt, Peter R.; Moss, Laura-Eve (2005). The encyclopedia of New York State. Syracuse, NY: Syracuse University Press. p. 118. ISBN 978-0-8156-0808-0. ^ Ներսիսյան, Մ. Գ. (1961). “Քաղաքական պատերազմը Ամերիկայում հայ պարբերական մամուլի լուսաբանությամբ”. Պատմա-Բանասիրական Հանդես (2): 47-66. http://hpj.asj-oa.am/332/. ^ Malcom 1919, p. 63. ^ a b Փիրումեան & Ավագյան 2003, p. 34. ^ a b Blake, William D. (2011). This day in Christian history. Ulrichsville, Ohio: Barbour Pub.. p. 18. ISBN 978-1-60260-646-3. ^ Hovannisian 1997, p. 390. ^ Malcom 1919, p. 71. ^ a b Bakalian 1993, p. 13. ^ Avakian 1977, p. 40. ^ Bakalian 1993, p. 9. ^ a b c d Bakalian 1993, p. 10. ^ Փիրումեան & Ավագյան 2003, p. 35. ^ a b Malcom 1919, p. 67. ^ Malcom 1919, p. 73. ^ Bakalian 1993, p. 184-185. ^ Mirak 1983, p. 399. ^ a b Powell, John (2005). Encyclopedia of North American immigration. New York: Facts On File. pp. 17–18. ISBN 978-1-4381-1012-7. ^ a b Փիրումեան & Ավագյան 2003, p. 37. ^ Diasporas and ethnic migrants 2003, p. 160. ^ Bakalian 1993, p. 11. ^ Samkian 2007, p. 101. ^ Bakalian 1993, p. 8-9. ^ Bakalian 1993, p. 80. ^ Diasporas and ethnic migrants 2003, p. 161. ^ a b c Bedevian, Harry Sahag (2008). Student, Staff, and Parent Perceptions of the Reasons for Ethnic Conflict Between Armenian and Latino Students. ProQuest（英語版）. pp. 5–6. ISBN 978-0-549-60688-8. ^ Nectar Davidian, The Seropians (Berkeley, 1965). p. iii; Bishop Mushegh Seropian [Serobian], ed., Amerikahay Taretsuytse 1912 [American Armenian Almanac] vol. 1. Boston: Kilikia Tparan, 1913, p. 56. ^ a b Starr, Kevin (2006). Coast of dreams: California on the edge, 1990–2003. New York: Vintage Books. p. 175. ISBN 978-0-679-74072-8. ^ a b Kazandjian 2006, pp. 27-28. ^ a b Փիրումեան & Ավագյան 2003, p. 44. ^ Bernard Augustine De Voto (1957). Saturday Review (Saturday Review Associates) 40: 16. ^ a b c Փիրումեան & Ավագյան 2003, p. 41. ^ a b Փիրումեան & Ավագյան 2003, p. 45. ^ Փիրումեան & Ավագյան 2003, p. 40. ^ Khanam, R. (2005). Encyclopaedic ethnography of Middle-East and Central Asia. New Delhi: Global Vision. p. 54. ISBN 978-81-8220-062-3. ^ Adalian 2010, pp. 397-398. ^ a b c Samkian 2007, p. 102. ^ Naficy, Hamid (1993). The making of exile cultures Iranian television in Los Angeles. Minneapolis: University of Minnesota Press. pp. 86–87. ISBN 978-0-8166-2084-5. ^ Sisson, Richard (2006). The American Midwest: an interpretive encyclopedia. Bloomington, Indiana: Indiana Univ. Press. p. 320. ISBN 978-0-253-34886-9. ^ a b Փիրումեան & Ավագյան 2003, p. 51. ^ a b c d Laderman, Gary (2003). Religion and American cultures. Santa Barbara, Calif.: ABC-CLIO（英語版）. p. 302. ISBN 978-1-57607-238-7. ^ Փիրումեան & Ավագյան 2003, p. 38. ^ Bakalian 1993, p. 93. ^ a b Փիրումեան & Ավագյան 2003, p. 46. ^ Bakalian 1993, p. 185. ^ a b National Council of Ch of Christ in USA (2012). “Armenian Apostolic Church of America”. Yearbook of American & Canadian Churches 2012. Abingdon Press. ISBN 978-1-4267-5610-8. ^ Arax, Mark (1997). In my father's name: a family, a town, a murder (August 1997. ed.). New York: Pocket Books. pp. 31–32. ISBN 978-0-671-01002-7. ^ Փիրումեան & Ավագյան 2003, p. 77. ^ Markowitz, Fran; Stefansson, Anders H. (2004). Homecomings. Lanham, Maryland: Lexington Books. p. 122. ISBN 978-0-7391-0952-6. ^ Samkian 2007, p. 26. ^ Փիրումեան & Ավագյան 2003, p. 42. ^ Bakalian 1993, p. 186. ^ von Voss 2007, p. 11. ^ Brzezinski, Zbigniew. "A Dangerous Exemption." 'Foreign Policy（英語版） 1 July 2006: 63. ^ Dorman, Shawn (2011). Inside a U.S. embassy: diplomacy at work. Washington, D.C.: Foreign Service Books. p. 10. ISBN 978-0-9649488-4-6. ^ von Voss 2007, p. 36. ^ Barkan, Elliott Robert (2001). Making it in America: a sourcebook on eminent ethnic Americans. Santa Barbara, California: ABC-CLIO. p. 333. ISBN 978-1-57607-098-7. ^ Hovanissian, Richard (2007). The Armenian genocide: cultural and ethical legacies. New Brunswick, New Jersey: Transaction Publishers（英語版）. p. 221. ISBN 978-1-4128-0619-0. ^ Adalian 2010, p. 192. ^ Adalian 2010, p. 415. ^ Talevski, Nick (2006). Knocking on heavens's door: rock obituaries. London: Omnibus Press. p. 582. ISBN 978-1-84609-091-2. ^ a b c d Adalian 2010, p. 255. ^ Adalian 2010, p. 254. ^ a b Adalian 2010, p. 281. ^ Bobelian, Michael (2009). Children of Armenia: a forgotten genocide and the century-long struggle for justice. New York: Simon & Schuster（英語版）. p. 169. ISBN 978-1-4165-5725-8. ^ Herzig, Edmund; Kurkchiyan, Marina (2005). The Armenians: past and present in the making of national identity. London: RoutledgeCurzon. pp. 231–232. ISBN 978-0-7007-0639-6. ^ Krikorian, Robert O.; Masih, Joseph R. (1999). Armenia: at the crossroads. Amsterdam: Taylor & Francis. pp. 38–39. ISBN 978-90-5702-345-3. ^ Bulbulian, Berge (2000). 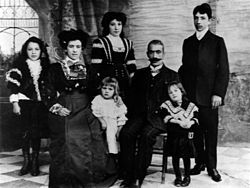 The Fresno Armenians: History of a Diaspora Community. Fresno: The Press at California State University, Fresno（英語版）. p. 193. ISBN 0912201355. ^ Tashjian, James H. (1952). “'Transport' Maghakian”. Armenian Review 5: 43. ^ von Voss 2007, p. 237. ^ Avakian, Arra S. (1998). Armenia: a Journey Through History. Electric Press. pp. 311–314. ISBN 978-0-916919-20-7. ^ Mike Agassi, Dominic Cobello (2004). The Agassi story. Toronto: ECW Press. p. 12. ISBN 978-1-55022-656-0. ^ Lutz, Stuart (2010). The Last Leaf: Voices of History's Last-Known Survivors. Prometheus Books. p. 341. ISBN 978-1-61614-310-7. ^ Barkan, Elliott Robert (2001). Making it in America: a sourcebook on eminent ethnic Americans. Santa Barbara, California: ABC-CLIO. pp. 217–218. ISBN 978-1-57607-098-7. ^ Gabaccia, Donna (2000). We are what we eat: ethnic food and the making of Americans. Cambridge, Massachusetts: Harvard University Press（英語版）. p. 76. ISBN 978-0-674-00190-9. ^ a b Simich, Jerry L.; Wright, Thomas C. (2010). More peoples of Las Vegas: one city, many faces. University of Nevada Press. p. 143. ISBN 978-0-87417-817-3. ^ Dr Helmut K Anheier, David C. Hammack (2010). American foundations: roles and contributions. Washington, D.C.: Brookings Institution Press. p. 241. ISBN 978-0-8157-0339-6. ^ Nicol, Neal; Wylie, Harry (2006). Between the dying and the dead: Dr. Jack Kevorkian's life and the battle to legalize euthanasia. Madison: University of Wisconsin Press. p. 27. ISBN 978-0-299-21710-5. ^ Gore, Patrick Wilson (2008). 'Tis some poor fellow's skull: post-Soviet warfare in the southern Caucasus. New York: iUniverse（英語版）. p. 21. ISBN 978-0-595-48679-3. ^ Akopian, Aram (2001). Armenians and the world: yesterday and today. Yerevan: Noyan Tapan. p. 61. ISBN 978-99930-51-29-9. ^ Washington Journalism Review: WJR. 11. Washington Communications Corporation. (1989). Adalian, Rouben Paul (2010). Historical Dictionary of Armenia. Lanham, Maryland（英語版）: Scarecrow Press. ISBN 978-0-8108-7450-3. Avakian, Arra S. (1977). The Armenians in America. Minneapolis: Lerner Publications. ISBN 0-8225-0228-3. Bakalian, Anny (1993). Armenian Americans: From Being to Feeling Armenian. New Brunswick, New Jersey: Transaction Publishers（英語版）. ISBN 1-56000-025-2. Kazandjian, Seta (2006). The Effects of Bilingualism and Acculturation on Neuropsychological Test Performance: A Study with Armenian Americans. ProQuest（英語版）. ISBN 978-0-542-84512-3. http://books.google.com/books?id=ELchZyS4PRIC&pg=PA27. Malcom, M. Vartan (1919). The Armenians in America. Boston: Pilgrim Press. ISBN 1-112-12699-6. 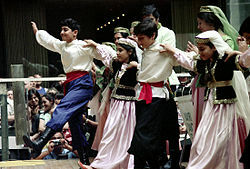 Sabagh, Georges; Bozorgmehr, Mehdi; Der-Martirosian, Claudia (1990). 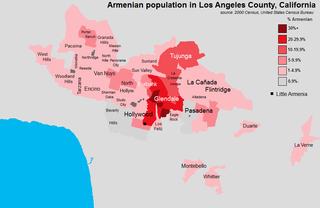 Subethnicity: Armenians in Los Angeles. Institute for Social Science Research, University of California Los Angeles. http://escholarship.org/uc/item/7jp6m12s#page-2. Samkian, Artineh (2007). Constructing Identities, Perceiving Lives: Armenian High School Students' Perceptions of Identity and Education. ProQuest. ISBN 978-0-549-48257-4.
von Voss, Huberta (2007). Portraits of hope: Armenians in the contemporary world. New York: Berghahn Books. ISBN 978-1-84545-257-5. Münz, Rainer; Ohliger, Rainer, ed (2003). Diasporas and ethnic migrants: German, Israel and post-Soviet successor states in comparative perspective. Routledge Studies in Nationalism and Ethnicity. London: Routledge. ISBN 978-0-7146-5232-0. Փիրումեան, Ռուբինա; Ավագյան, Քնարիկ (2003). “Ամերիկայի Միացյալ Նահանգներ (ԱՄՆ)”. In Այվազյան, Հովհաննես. Հայ Սփյուռք հանրագիտարան. 1. Երևան: Հայկական Հանրագիտարան. pp. 33–85. ISBN 5-89700-020-4.